The Minecraft 3D Mod is a new modification by ‘Noppes’ and ‘SCMowns’. This mod is aiming to replace all of Minecraft’s default textures with better, higher quality 3D objects. As of yet, this mod is only in Beta stages but it is making good progress towards completion! I recommend downloading it right away, some of the objects are unlike any others seen in Minecraft! To use the Minecraft 3D Mod, you first of all need to download and install it. Then you can open up your Minecraft save and enjoy automatically viewing the new 3D models! Please bare in mind that this mod is in Beta stages, and Minecraft Forge is necessary for installation. This mods features includes the 3D modelled additions for many of the vanilla objects in Minecraft. As of yet, objects such as the Iron Sword, the Apple, Anvil, Bone and Bookshelf all have a 3D replacement! Many many more are also available, so what are you waiting for? Download now! 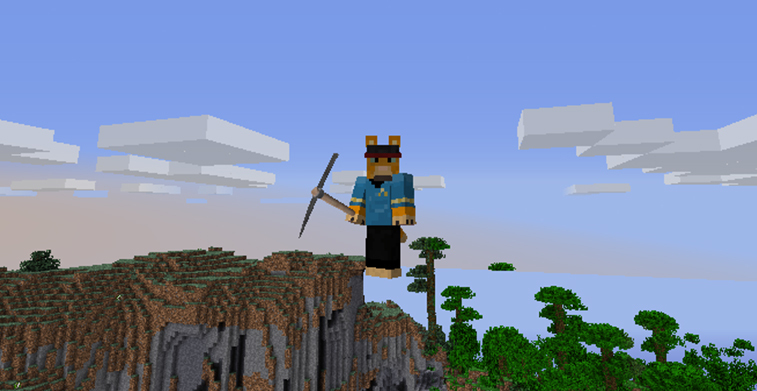 In this screenshot, you can see the 3D version of the Minecraft pickaxe! Next, open your Minecraft directory and delete the META-INF file from there. Then, open your %appdata%/.minecraft/resourcepacks folder and drag and drop your download .zip files. Open up your Minecraft save file and enjoy looking at all of the new 3D models! VERSION 1.0: Added a 3D replacement for the items: Anvil, Apple, Sugar Cane, Bamboo, Grass, Yellow Flower.